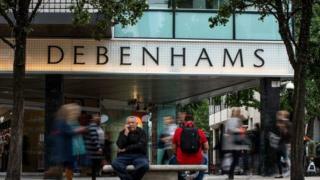 Debenhams has secured a cash injection of £40m to buy it extra time as it battles to secure a longer term deal with lenders. The struggling department store chain called it a “first step” towards a sustainable future. The firm – which issued three profit warnings last year – is in talks with lenders over renegotiating its debts. It is also trying to accelerate plans to close stores, and is expected to close around 20 outlets this year. The extra money will extend the retailer’s current £520m borrowing facilities with banks for 12 months and enable it to continue talks over a longer term refinancing. Debenhams chief executive Sergio Bucher said: “Today’s announcement represents the first step in our refinancing process. However, it is now trying to secure an insolvency deal that would enable it to bring forward the closure of around 20 department store chains to this year. Debenhams has 165 stores and employs about 25,000 people. Mr Bucher is continuing as chief executive of Debenhams but no longer sits on the board, while Sir Ian Cheshire stepped down immediately as chairman.